Scientists this month reported on the whole-genome sequencing of the cartilaginous fish, the elephant shark, the first complete analysis of any of the non-bony fish . These fish are very important in understanding early vertebrate evolution in which gnathostomes branched into two lineages, the bony fish or osteichthyes like the salmon or tuna we know today, and cartilaginous fish such as sharks. Vertebrates are of course derived from the bony fish, specifically from the sarcopterygii or lobe-finned fish whose ancestors eventually made their way up onto land and became the tetrapods. The researchers report that, unexpectedly, the elephant shark has one of the smallest genomes amongst similar fish at approximately 1 billion base pairs in length, which is also surprisingly highly conserved. (For comparison, the human genome is about 3 billion base pairs long.) 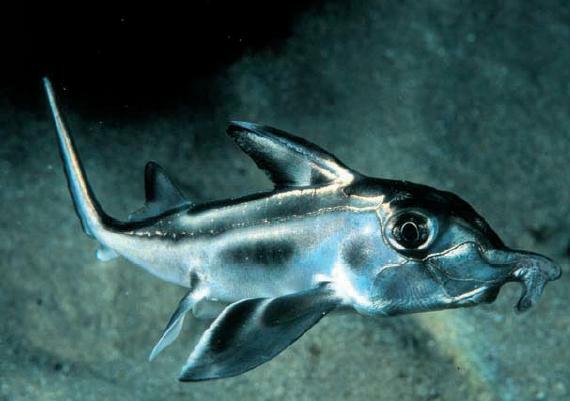 A previous study on the elephant shark had reported that this animal’s genome in fact had more in common with the human genome than with its close relative, the teleost fish, whose genome has undergone an unusual level of duplication and rearrangement after the vertebrate division between lobe-finned and ray-finned fish . The scientists in the current study report that elephant sharks appear to lack important secretory calcium-binding phosphoproteins (SCPP), which may explain why, even though they are able to form cartilage, that cartilage is never ossified with calcium to form bone. Hence the name “cartilaginous fish”. The family of SCPP is thought to have been derived from duplications and recombination of the gene, SPARCL1. SPARCL1 in turn appears to have been derived from the gene, SPARC. While I can’t seem to find any genetics study that has looked at factors underlying SPARCL1‘s instability, such as vulnerable break points lying at repetitive sequence elements, the human gene does contain approximately 75 transposable elements and is often inactivated in some cancers . Take these together with its evolutionary history for duplications and it starts to make some sense how, at some point, differences in repetitive element content, perhaps in the form of newly inserted transposable elements, between gnathostomes could have lead to instability and ultimately the development of a whole family of calcium-binding phosphoproteins and bone formation in a subset of fish that went on to form the vertebrates. Image illustrating the slow ossification of bone over human development. Image borrowed from here. I suppose what I find so interesting about this study, aside from the fact that I appreciate having bones, is that it illustrates how different types of repetitive elements, e.g., transposable elements, in different species’ genomes can lead to very different genomic evolutionary trajectories. For instance, one of the big differences between mouse and man is the Alu short-interspersed element. Not only is this type of retrotransposon completely lacking in mouse, but it has also had an unusual propensity for latching onto the transcriptional machinery and becoming part of human gene transcripts and sometimes even part of the translated protein itself. Even compared to our closest living relative, the chimpanzee, Alu elements have been about twice as successful at propagating in our genomes than in the chimp; meanwhile, sequence diversity of Alu‘s is about 1.7 times higher in chimps, probably a reflection of the different selection pressures on these sequences in our different genomes . Transposable elements are not the only source of instigation for genomic rearrangements. Pretty much any kind of repetitive sequence can suffice. The advantage which transposable elements usually have over other types of repetitive DNA is that they can basically procreate by utilizing the cell’s machinery to make more copies of themselves which can then (potentially) reinsert elsewhere in the genome. Meanwhile, simple repetitive DNA sequences and larger segmental duplications must rely, basically, on “accidents” of transcription or replication in order to perpetuate themselves. Sometimes, however, as in the case of some of the genes in the teleost fish, this can also lead to complete losses of genes too. A dangerous game, this genomic evolution. Some guys play it safe like the elephant shark, others gamble, like the teleost. But, hey, that’s diversity in a nutshell, am I right?